Diondray’s Roundabout is now released. It is the third novel set in the world of Kammbia. I really enjoyed writing this one and Diondray’s journey through Southern Kammbia will be one of a change for the entire world. Could he be the one foretold? Faith and doubt wrestle to save the world. Could his doubt stand in the way of his nation’s unity? His doubt may prove the undoing of his world. When you wrestle with destiny, who wins? In a struggle with doubt could rest the destiny of a nation. Within the struggle between doubt and faith rested the nation’s destiny. Must one embrace one’s destiny to effect change? The answer to one question could change the fortunes of a nation. 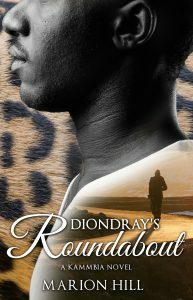 Diondray’s Roundabout is the thrilling third installment set in the imaginative and colorful world of Kammbia.